The main dish is of course central to your meal preparation. 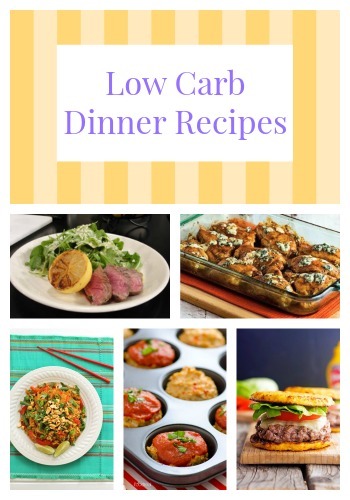 If you find yourself frequently turning to the same low carb recipes day in and day out for your family dinner, then this page is perfect for you. Here are our Top 10 Healthy Dinner Recipes for a Low Carb Diet that you need to try today! On this page, you'll find the best beef recipes, chicken recipes, turkey recipes, and more. For even more low carb recipes, be sure to check out and download our 26 Free Low Carb Recipes eCookbook. With this eCookbook, you'll find some of the very best low carb recipes around. This eCookbook is absolutely necessary for anyone following a low carb diet. Note: The nutrition information provided below is for one serving size. Want even more healthy recipes? Check out our 24 Best Ever Low Carb Diet Recipes. This Grilled Steak is full of flavor, so each juicy bite will leave you wanting more. You can bet that this low carb dinner recipe will fill you up and leave you feeling satisfied. Make this meal when you're extra-hungry! You would never imagine that a hamburger bun recipe could be this healthy. Because this healthy recipe uses cauliflower to make the bun, you can be sure that this recipe will follow your low carb diet. Note: The nutrition information provided below is for the cauliflower crust only. When you don't want to slave over a hot stove, you should make this Slow Cooker Paleo Beef Bourguignon. Each spoonful of this meaty meal will leave you wanting more and more. Plus, this is a paleo recipe, so you can be sure that this low carb diet recipe is all-natural. You and your family are going to love this easy chicken recipe. The bleu cheese and buffalo sauce come together to create the best possible chicken dinner. Be sure to save this recipe because you'll want to make it again and again. Cooked in only two minutes, this chicken recipe is incredibly moist and flavorful. You'll never get dry, boring chicken when you make this yummy low carb dinner recipe. You should make this chicken recipe for dinner tonight. Although you wouldn't imagine using your muffin tin to make meatloaf, you'll never look back after making these turkey meatloaf muffins. This meatloaf recipe is simply one of the best meatloaf recipes around. Using ground turkey instead of ground beef, these stuffed peppers are much healthier than other stuffed pepper recipes. We recommend that you make these stuffed peppers as soon as possible. It takes only 30 minutes and four simple steps to make this healthy casserole recipe. So, you won't have to spend hours in the kitchen to prepare a healthy dinner for your family. It'll be hard to find a better recipe than this one. Toss out your carb-heavy spaghetti noodles because spaghetti squash is a fantastic, low-carb substitution. You'll agree that this spaghetti squash recipe is absolutely amazing. The creamy mushroom sauce is the perfect sauce for this healthy dinner recipe. Finally, we give you this Skinny Girl's Pad Thai. This spaghetti squash recipe uses traditional Thai seasonings and sauces to create an unforgettable meal. This healthy dinner could have come out of a five-star restaurant. It's simply that good. 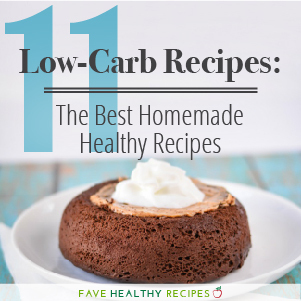 If you enjoyed these healthy dinner recipes, then you will absolutely love our 11 Low-Carb Recipes eCookbook! If you want to keep track of your own calorie and carb intake, then check out this handy calorie counter. This is the tool that we use to find a recipe's nutrition information. The creamy mushroom spaghetti squash has definitely peaked my interest! I have just recently started cooking spaghetti squash, so I am really excited to try new recipes! I haven't had stuffed peppers in the longest time, but these look really good. Time to try them again! I love cooking with spaghetti squash. Can't wait to add the Pad Thai to my recipes! I've never heard of cauliflower crust hamburger buns before. Looking forward to trying this unique recipe! 30 minute spinach egg casserole...I'm going to try that one!